Cultivate baby’s musical talent and spatial skills with Kick-and-Play from MOOTOYS! 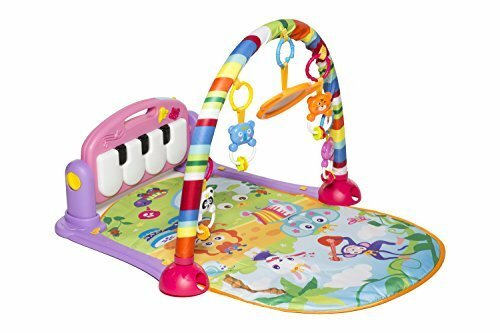 With hanging toys for your baby’s hands and musical keys for the feet, this soft-padded play mat will keep your baby engaged with many modes of play! From laying and playing, to tummy time and sitting up, baby’s in charge of the action. Overhead hanging toys like a hippo teether, elephant clackers, rollerball frog and more will encourage batting, grasping, and hand-eye coordination. Piano keys at the foot end of the mat can be activated with the feet to produce music and sounds!